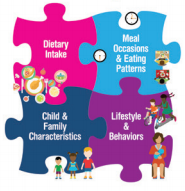 Through our large-scale research projects in the United States and around the world, we are developing a deeper understanding of the dietary intake and lifestyle behaviors of children from infancy through early adolescence that impact health. Our Feeding Infants and Toddlers Study (FITS) focuses on children from 0–4 years old and our Kids Nutrition and Health Study (KNHS) focuses on children from 4–12 years old. First launched in 2002 and repeated in 2008, FITS’ third round of data collection was launched in 2015. We gathered dietary intake data and collected comprehensive information on feeding habits, physical activity, food security and participation in the Special Supplemental Nutrition Program for Women, Infants and Children (WIC). Two scientific papers were published in peer-reviewed journals in 2015. FITS 2008 research showed that many parents do not recognize overweight/obesity in their children and may not be aware of eating behaviors and activities that are necessary for developing lifelong healthy habits (published in Preventing Chronic Disease). KNHS research revealed key insights into the dietary patterns of kids 9–2 years old, most notably that 17% of kids in this age group are skipping lunch. This manuscript was accepted for publication by the Journal of the Academy of Nutrition and Dietetics and made available in February 2016. A review of parenting styles, feeding styles and feeding practices related to obesity risk in children was published in Frontiers in Psychology. Both FITS and KNHS are helping Nestlé better understand children’s eating patterns and nutritional requirements, and helping define and improve our product formulations, consumer communications and educational programs.